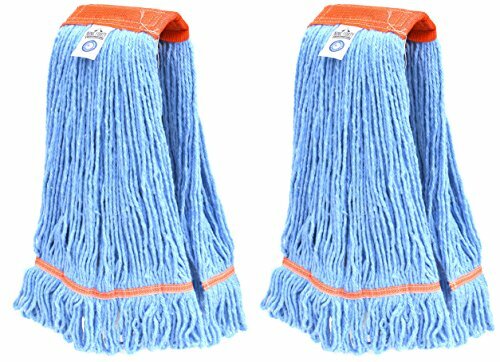 Industrial Strength Wet Mop Head Hand Made in the USA from Custom 4-Ply Synthetic Blend Yarn. Synthetic Blend Yarn Combines Materials to Create the Best Properties for Absorption, Release of Fluid (Drying), and Durability. Looped End Construction allows this Mop Head to be Laundered Giving it an Extended Service Life. Heavy Duty Multiple-Stitched Fan-band Prevents Tangles, Extends Mop Life, and Improves Floor Cleaning Performance and Launderability. Supply Guru Commercial Mop Head, X-Large, Universal Headband, Blended Yarn, With Nylon Scrubbing Pad, 32 Ounce, 4-Ply, Blue.